Who was Franklin D. Roosevelt? “Roosevelt was the 32nd president of the United States and was elected in 1933,” (Allport 39). He was born in 1882 and “died on April 12, 1945 due to a cerebral hemorrhage,” (Beschloss). He was the first president to break the unwritten rule that presidents could not hold presidency for more than two terms, “he held four terms from 1933-1949,”(Burgan 6). Roosevelt was a for the people kind of president. Roosevelt said “I pledge you- I pledge myself to a new deal for the American people,” ( Allport 24) in one of his most famous speeches. In the beginning of his presidency he passed laws based around the mission of saving the economy. During Roosevelt’s presidency the stock market crashed causing the Great Depression on October 26, 1929. The Great Depression started on a day “known as Black Tuesday, the stock market lost 14 billion dollars,” (Burgan 22). With this crash the nation was hit with great financial instability. In 1931 in an attempt to help the economy, Roosevelt established organizations whose sole purpose was to find jobs for those who were out of work. These organizations also helped get money to those who could not work because they were too old. In 1933 Franklin D. Roosevelt, ordered “all the nation’s banks to close for a few days,” (43). They were reopened, and the economy began to get better. Slowly but surely “people began to redeposit their savings” (44), the rate of those without work also began to decrease. Franklin said in speech on fear that, “the neighbor who resolutely respects himself and, because he does so, respects the rights of others…” (Franklin). 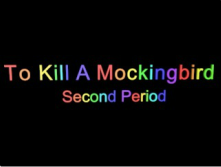 This portrays how the people of Maycomb acted in To Kill a Mockingbird. The people of Maycomb all knew each other and respected one another. When a member of the town fell ill everyone pitched in to help the member out. This ties into how Roosevelt talked about how people need to respect and help others, also how the government hand in hand can come to a solution to all problems. Harper Lee based the book To Kill a Mockingbird in the time period when Franklin D. Roosevelt was elected president of United States. In the book, Atticus, a lawyer is paid in goods and services instead of money for his duties in court. Early one morning Jem and Scout find wood in the back yard, their father tells them that it was payment from Mr. Cunningham. When the stock market crashed people resorted to using goods and services as currency. For example in the story Scout asks why Mr. Cunningham pays Atticus with goods. Atticus said, “Because that’s the only way he can pay me. He has no money,” (Lee 21). With Mr. Cunningham being a farmer, he had little to no money before the stock market crashed. Therefore he has little money to support his family let alone pay for legal help, paying with goods and services were the only ways to pay Atticus. In conclusion Franklin D. Roosevelt was a for the people president who worked most of the 12 years of his presidency on saving the economy of the United States. The story To Kill a Mockingbird is written to be based around the time that Roosevelt was elected as president. Therefore the people of Maycomb suffer money troubles brought on by the Great Depression. The Great Depression is why most of the people in Maycomb are so poor.